I just got back from the first day of Google I/O. What an exciting day for mobile web advocates like me. In the keynote CEO Eric Schmidt and Vice President of Developer Platforms Vic Gundotra said “mobile” so many times I lost count. There were some significant announcements and Schmidt promises even bigger ones tomorrow. From the keynote to the “After Hours” party, it was a long day. I’ve only had time to write up a few highlights but will post more tomorrow. A major theme of the keynote was Google’s belief that the future is mobile and it will be web based. That’s right, forget mobile apps, the next wave of mobile innovation will be web apps based on the new features of HTML5 like offline storage and standards based native video and drawing capabilities. In a press briefing after the keynote Gundotra said that mobile apps are needed today because browsers are immature. Google’s vision is that eventually everything except a few specialized applications will be services in the “cloud” accessed through the browser. Java Language Support in App Engine: Previously a closed Beta, Java language support in the App Engine is now available to all developers. At the end of the keynote, Gundotra announced to wild applause that every one of the over 4000 attendees at the event would receive an Android phone and 30 days of voice and data service. A drag and drop user interface builder is in the development pipeline. Donut will feature new APIs for incremental search and text to speech. Multi-touch isn’t really supported by the touchscreens on current devices. There are hacks to make it work but hardware limitations mean it breaks when coordinates cross. 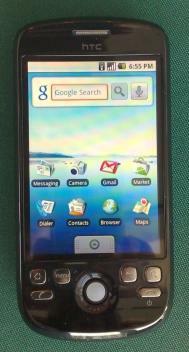 It was hinted that when a device has the hardware to support it Android will have multi-touch. Active Widgets on home screen will not be in Donut. There are major performance and security issues with home screen widgets. As everyone knows the release after “Cupcake” is “Donut”. But did you know the one after that will be “Eclair”. 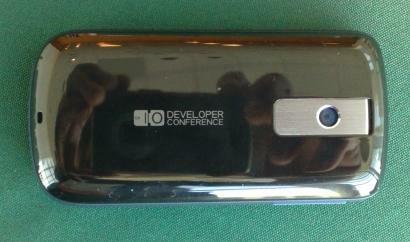 The phones the attendees got are branded with the Google I/O logo on the back and on the initial boot up screen. I took a couple of photos of mine which are attached. The phones seem to be physically identical to the T-Mobile Magic released in the UK recently but not yet available in the US. They are developer phones and are unlocked and have a boot loader that allows them to be flashed with any firmware. Each phone came with an activated T-Mobile USA SIM with 30 days of unlimited data, 2000 voice minutes and 2500 text messages. I’ve just started playing with mine but so far I’m very impressed with it. This entry was posted in Google and tagged Android, googleio, io2009 by Dennis Bournique. Bookmark the permalink. Jason. I talked to a couple members of the Android team at Google I/O and received an explanation. Android Widgets, which were introduced in Cupcake, are built with Java and XML just like Android apps and can display active content on the home screen. Android Widgets are fully supported and are not going away. Web Widgets are not supported in Android currently and aren’t on the road map. One issue with Web Widgets is performance, the browser engine is big and having to load it when the home screen initializes would slow down start up and consume a lot of memory. The other issue is security. The browser itself has a lot of security built in because it executes potential malicious content external content. The home screen was only designed to handle local content and doesn’t need or have as much security. I could be wrong about this but my understanding is that the current home screen widgets don’t display changing “Active” content like an indicator of new mail, unread tweets or a changing weather forecast icon. Widget icons on the home screen are supported but widgets running in the background and updating the homes screen in real-time aren’r supported. Does this imply that the Home screen widgets that have just arrived as part of the 1.5 firmware update will be removed for Donut?